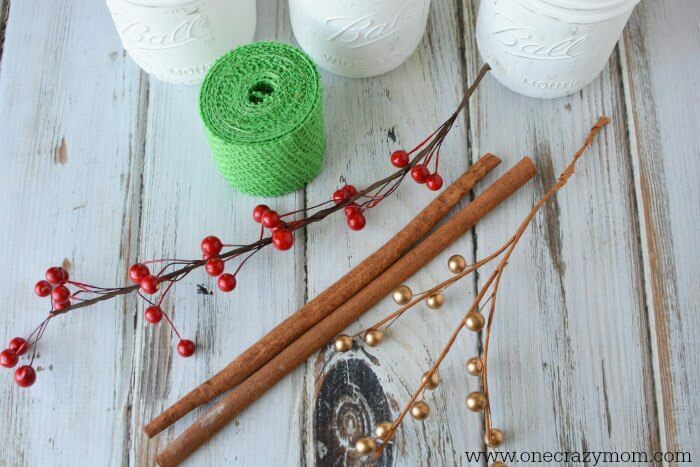 Are you looking for holiday centerpiece ideas that are simple but pretty? 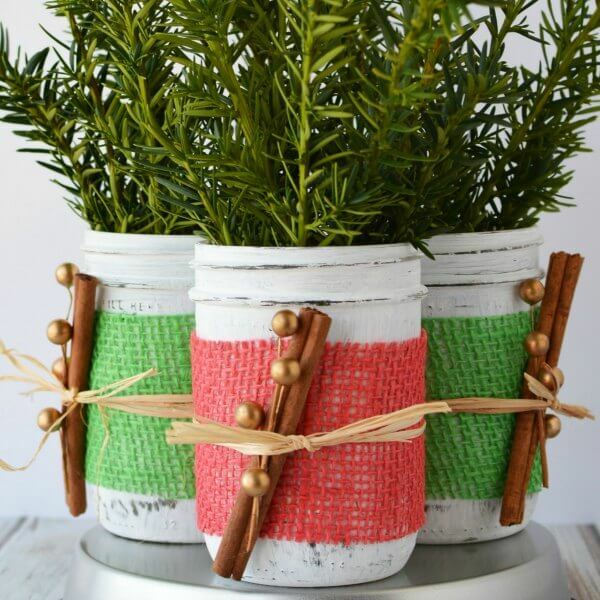 This rustic Christmas centerpiece is so charming and just perfect for the holiday season. I love crafts that use what I have on hand or things from nature! 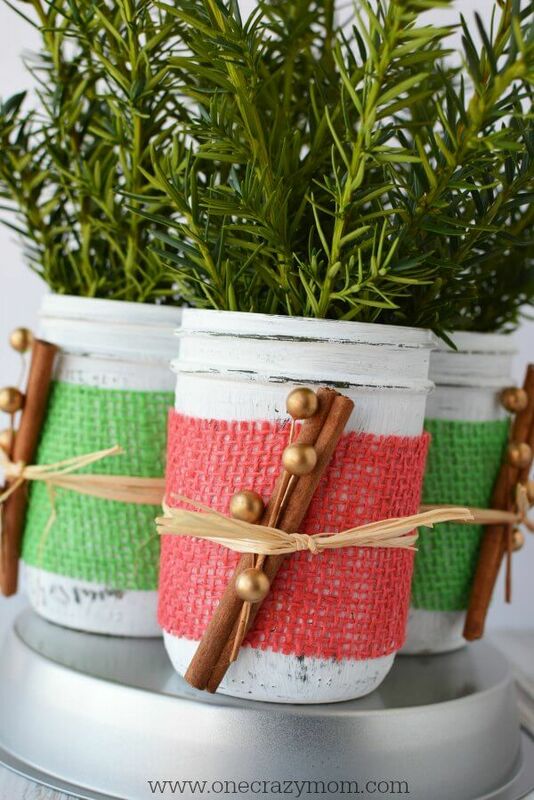 This pretty mason jar centerpiece uses fresh evergreen, cinnamon, twine and burlap for a gorgeous Christmas decorations. Mason jar centerpiece ideas are so pretty and versatile. 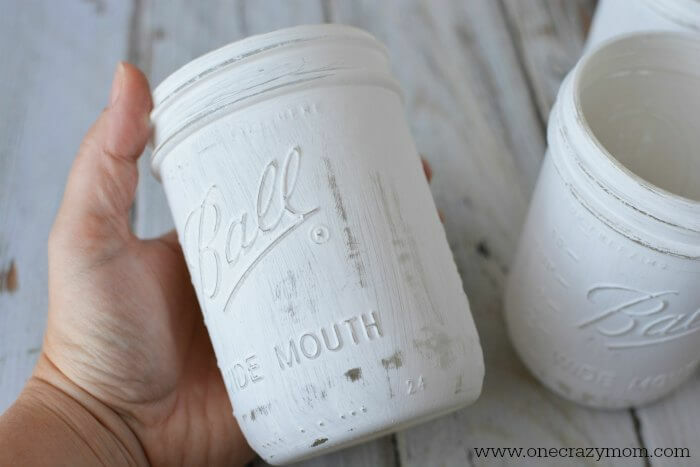 Many of us have mason jars on hand and projects like this cost very little. They don’t take a lot of time to do but the outcome is just amazing. Burlap is so rustic and pretty. 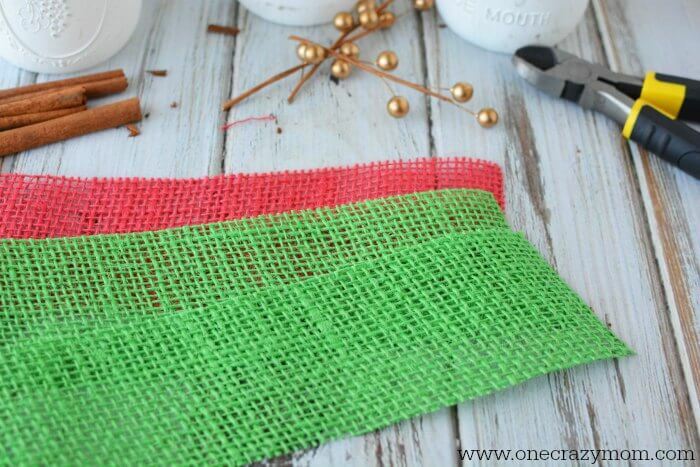 Alternate red and green burlap to make this mason jar centerpiece even more festive. 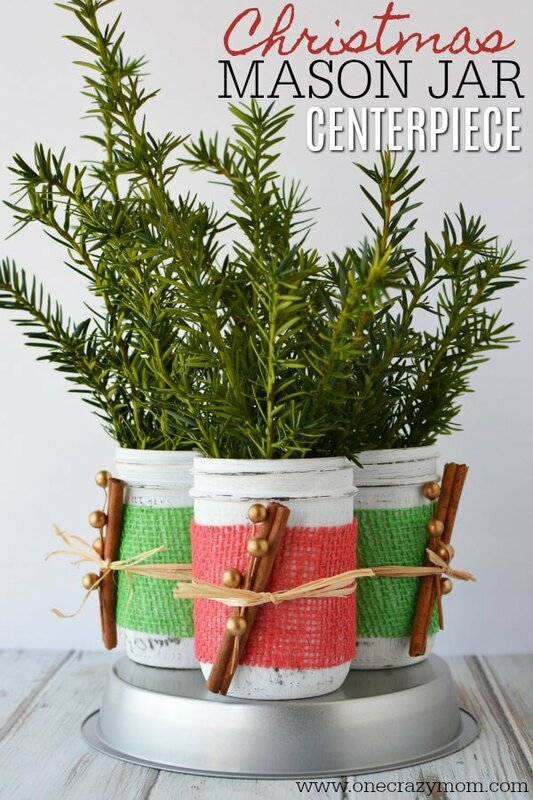 Let’s make this gorgeous Mason Jar Centerpiece! This is one of my favorite holiday centerpiece ideas. It’s so pretty and the evergreen and cinnamon make it smell amazing. 1. 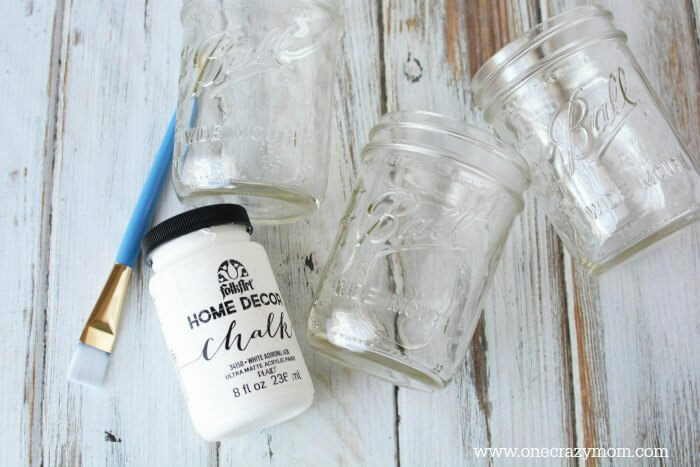 Paint the mason jars with paint. I used 1 coat because I wanted the brush strokes to show and the jars to look rustic. Let dry completely. 2. Once dry, lightly sand them. This allows the raised edges to show some detail. 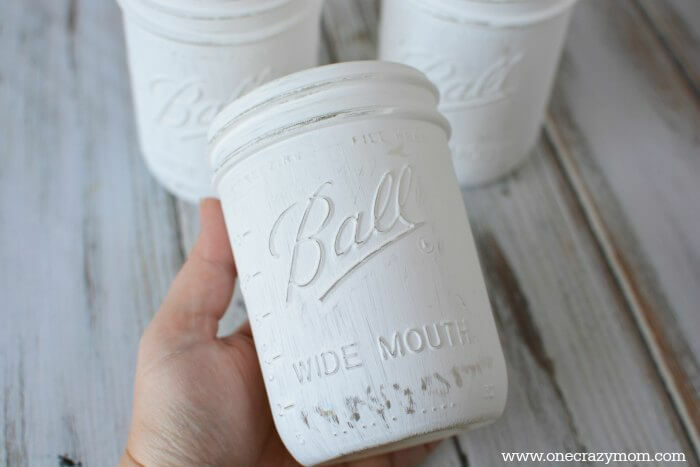 You can also create some scuffs on the side of the jars giving the pieces more of a rustic feel. 3. 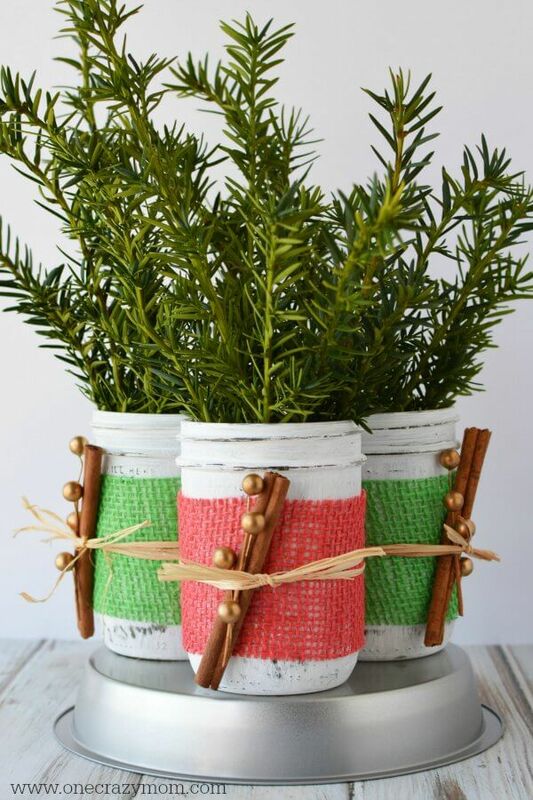 Cut 2 pieces of green and 1 piece of red ribbon by wrapping it around the jar and trimming so you have about a 1/2″ overlap. 4. 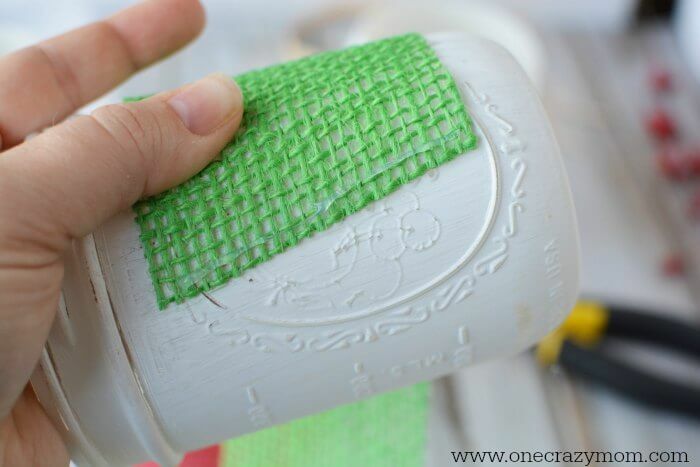 Wrap one piece of ribbon around the jar and secure it with hot glue. 5. 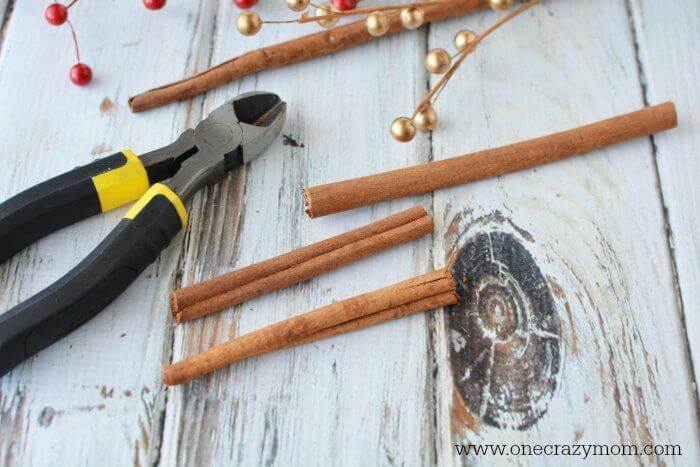 If necessary, trim cinnamon sticks with diagonal cutters. 6. 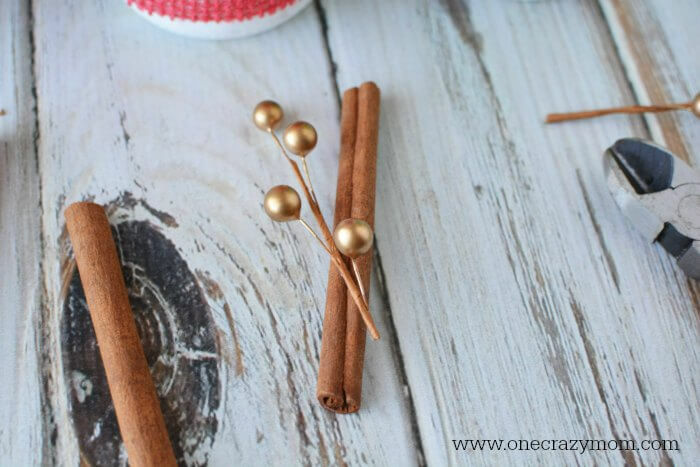 Add a gold berry to each cinnamon stick and attach with a tiny dab of hot glue. 8. 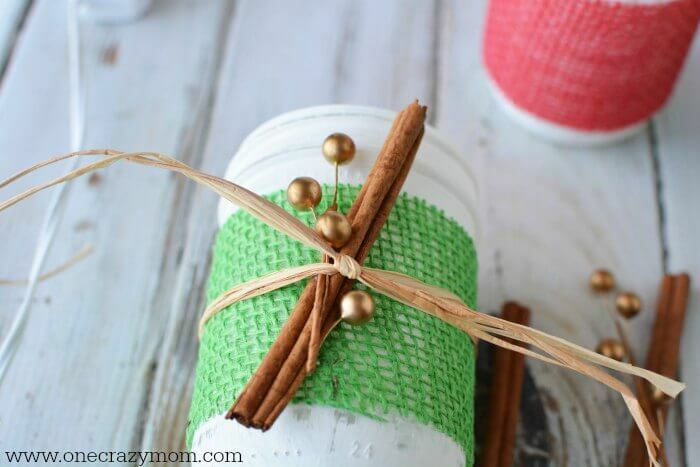 Wrap raffia around the jar securing in a double knot on top of the cinnamon sticks. Trim ends. Repeat for the additional 2 jars. 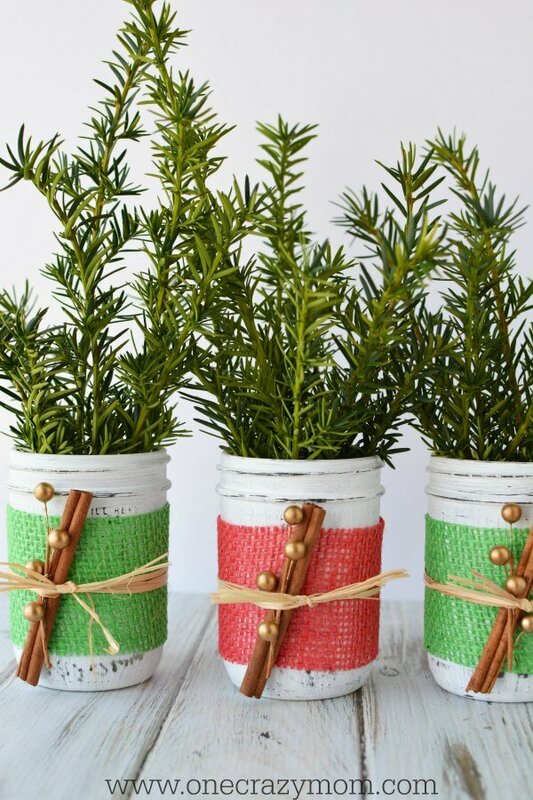 Fill the jars with your favorite fresh evergreen and display on your holiday table. 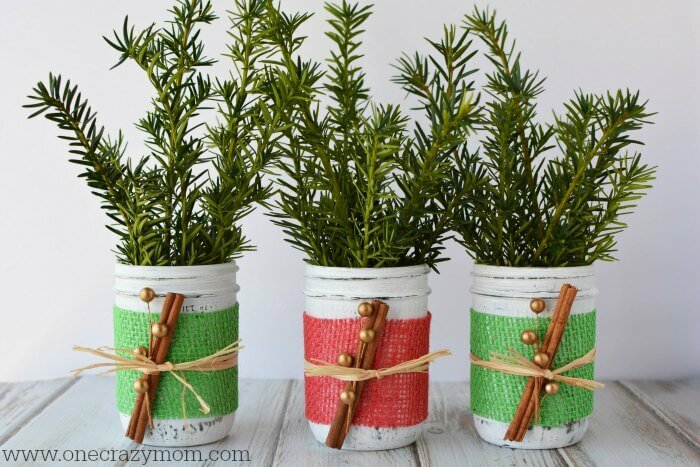 Let the kids help and by collecting evergreen and helping put them in the jars. You will make precious memories and have a helper! 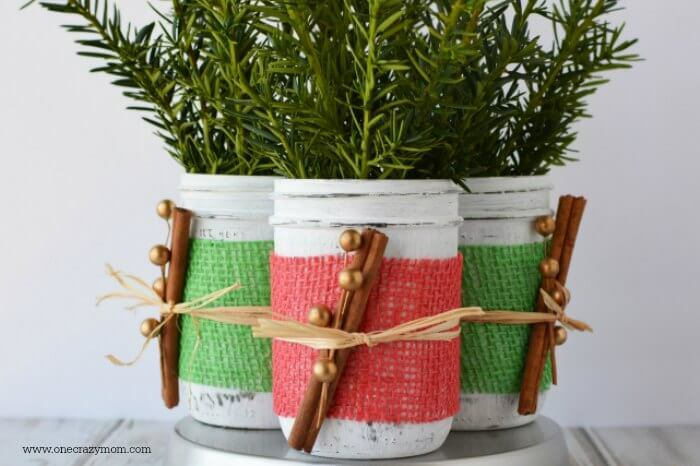 There are so many great holiday centerpiece ideas but this one is just so simple and rustic! It’s going to look great on your table as a gorgeous centerpiece. 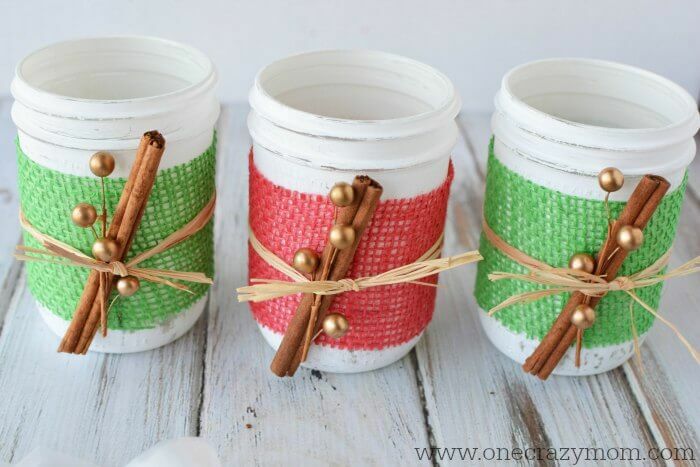 Try this Mason Jar Christmas Centerpiece and and let us know how it turns out!